1 dribbles at 2, who loops to come out top. To continue, 1 passes to 2 who dribbles at 3 who loops. 1 dribbles at 2 who backcuts. 3 replaces 1, 2 replaces 3. 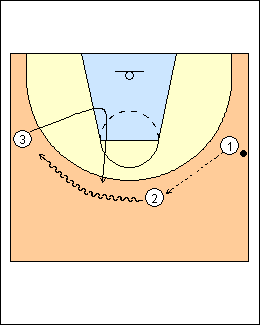 To continue, 1 passes to 3 who dribbles at 2 who backcuts. 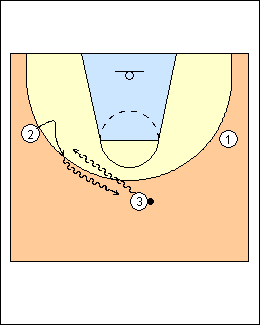 1 dribbles at 3, who takes one step away then comes for a hand-off and dribbles to the top. 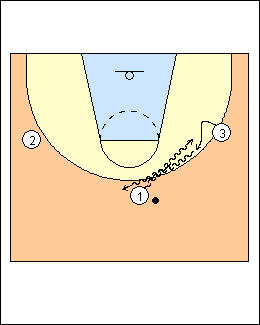 To continue, 3 dribbles at 2 for a hand-off.